What the reviewers have to say . . .
— Rita DeBellis, Calendars Editor, The Good Life . Mady Kaye is Austin’s premier straight-up, can-do-it-all vocalist. For many, the term ‘history lesson’ suggests a dry and dusty audit of some antique past, conducted by an ancient scholar almost as dessicated as the bones of his subject. But for those who attended the history lesson this past weekend at the Z Cabaret, the term ought to possess a much livelier character. 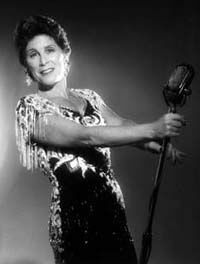 Make no mistake, it was a history lesson: from the get-go, longtime local chanteuse Mady Kaye made it quite clear that her “Tribute to Tin Pan Alley” was intended to enlighted its audience regarding the history of 20th-century American song. Via her opening aural collage, she walked us back in time to the streets of New York City just after World War I, where we could hear the music publishing house “pluggers”–in-house pianists whose job was to play the company’s hits over and over and over–tickling the ivories for passersby. And throughout the show, she filled our ears with names and dates, the hired-gun composers and lyricists whose melodic creations changed the face of popular music and the years in which they scored some of their biggest hits. Yes, Kaye was holding class last week. But when the subject of the lesson is as rich in romance and humor as America’s Golden Age of Song and your guide through the past is as enthusiastic and appealing as Mady Kaye, well, then the lesson is a pleasure. Kaye is an unabashed fan of the Great American Songbook, and just watching her fervor for it can be captivating. She dances her way through the subject, gliding from anecdote to anecdote, spinning from this composer to that, praising their work in turns light and graceful. And occasionally she’s even inspired to kick up her heels literally, as in a sprightly Charleston number. Her elation pulls us in and infects us. But Kaye beguiles her audience with more than her broad smile and playful patter. 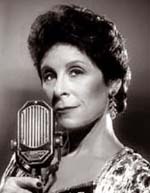 She is a skillful interpreter of Tin Pan Alley’s classics, and when she gives voice to these masterpieces of wit and romance, she communicates all the craft, all the feeling that has made these songs standards not merely because they brought a standardized approach to song structure but because they are embraced the world over as the standard for popular songs. Kaye’s polished technique makes every word clear, every clever phrase ring, even when her delivery is hushed. 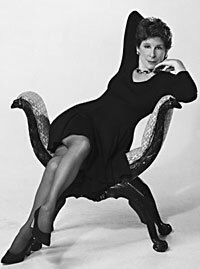 In fact, some of the singer’s most effective work comes when she sings softly; her voice comes out like a taut thread of silk: shiny but surprisingly supple and strong. Mean a Thing If it Ain’t Got that Swing” (which swung with a mightly jazz piano solo from accompanists Jeff Hellmer), Kaye’s “Tribute” provided a winning introduction to the subject, a survey course right up our alley. Her elation pulls us in and infects us. Her voice comes out like a taut thread of silk. – John Bustin, West Austin News Ms. Kaye displays her unusual vocal agility and her unfailing good taste. For complete review see this site. Her musical intelligence is formidable. Kaye and Campise brought down the house with an extended duet combining humor and talent. 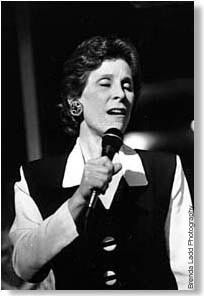 “Women in Jazz Dazzles Audiences” 10/15/96 She’s not just a pro, she’s an excellent and evocative vocalist. Mady Kaye. A very talented musician and singer in her own right, Mady Kaye is also a much sought after vocal instructor. Beginners with career aspirations and professionals who just want to keep their chops in shape are among her legion of satisfied students. Kaye’s main criteria for selecting students is that they share the same delight in singing and professional attitude reflected in her own work. – Howard Thompson, New York Times Putting the Sssssss in sophisticated.